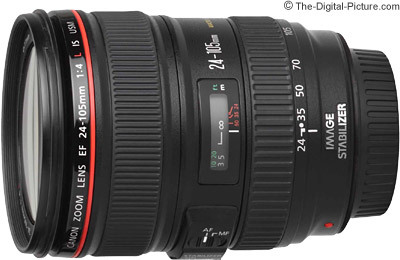 Note: The Canon EF 24-105mm f/4L IS USM Lens has been replaced by the Canon EF 24-105mm f/4L IS II USM Lens. Boasting the superb build, mechanical and optical quality found in the Canon L-Series Lenses and a widely used range of focal lengths, the Canon EF 24-105mm f/4L IS USM Lens is one of the best and most popular Canon general purpose lenses made. The 24-105 L Lens quickly became one of my favorite and most-used lenses. If I had only one lens, this would be the one. One of the most important features in a lens is the focal length or focal length range - get it wrong and you might not be able to take the shots you want. And the use for a particular focal length or focal length range varies, of course, depending on the FOVCF of the body being used. That said, this lens gives us a very nice general purpose focal range to work with. On a full frame body, 24mm is very wide. On a 1.6x body, 24mm is only moderately wide (equivalent of 38.4mm). And the advantage or disadvantage - whichever it is for you personally - is the opposite on the other end as well. When you care about the pictures, you want a well-built lens with great optical quality. The 24-105 L delivers in both of these regards. As you would expect from an L-Series Lens, the 24-105 L is solidly built. The zoom and focus rings are smooth and the entire lens feels nice and handles even better. I really like the size and weight of this lens in the field. Weather sealing seals the deal if you are going afield - note that Canon recommends a UV filter for complete weather sealing on this lens. I can't tell you how much "weather" this lens can take, and don't condone the practice, but I've cleaned my 24-105 L under a gently-flowing kitchen faucet. Do note that this is not a "waterproof" lens. I find the 77mm filter size to be an asset. This is not the least expensive filter size, but many of Canon's better lenses use this size. This makes sharing filters between lenses possible - which has various benefits including cost and travel size/space considerations. How does this size compare visually? Pictured above from left to right are the Canon EF 28-135mm f/3.5-5.6 IS USM Lens, Canon EF 17-40mm f/4L USM Lens, Canon EF 24-105mm f/4L IS USM Lens and Canon EF 24-70mm f/2.8L USM Lens. The same lenses are pictured below in their fully extended size. Of note is that the 24-70mm L reverse extends - it becomes longest at 24mm as shown above. Most lenses including the 24-105 L become fully extended at their longest focal length setting and their lens hoods travel along with this extension. 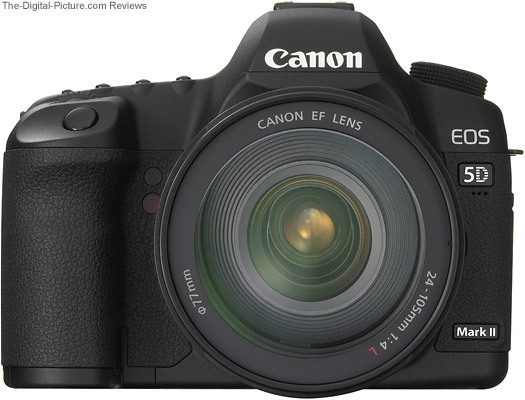 The 24-105 L's autofocus is driven by Canon's excellent Ring USM (Ultrasonic Motor). It is internal, fast, quiet - and accurate. The 24-105 L is deemed a parfocal lens - "There's a cam inside the 24-105mm lens that is designed to maintain an accurate focus when the lens is zoomed from tele towards wide." [Chuck Westfall, Canon USA] Though the image remains mostly in focus during focal length change, it is best to focus at the desired focal length. The 24-105 does not extend with focusing and the barrel does not rotate - which makes using circular polarizing and similar rotation-dependant filters much easier. FTM (Full Time Manual) focusing is available. Good build and mechanical quality does not mean much to a lens without good optical quality to go along with it. 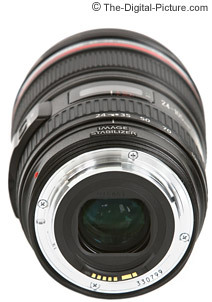 In this regard, the Canon EF 24-105mm f/4L IS USM Lens ranks at the top. The Canon EF 24-105mm f/4L IS USM Lens is quite sharp wide open and shows only very slight improvement when stopped down. Corner sharpness is very good - Full frame DSLR users will see some softness in the far corners at the wider focal lengths until stopped down. As with most lenses, full frame users will also see some light fall-off with the 24-105 L wide open - especially at the far corners at the widest focal lengths. The light fall-off quickly improves as the lens is stopped down. Reduced field of view Digital SLRs will avoid most of this effect. 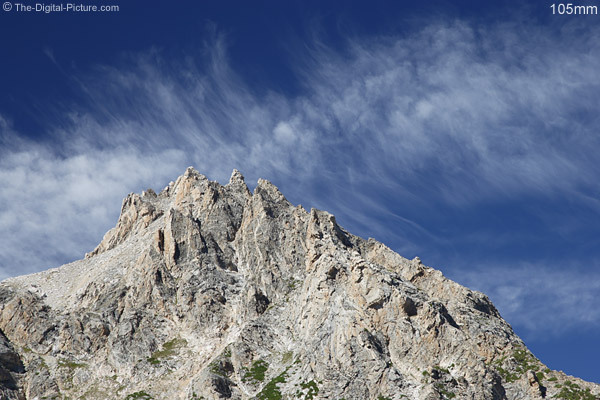 I see varying amounts of physical vignetting at 24mm when using a standard thickness circular polarizer filter - I recommend using a slim circular polarizer filter for this lens. Also common with lenses in this focal length range is distortion. The 24-105 L shows noticeable barrel distortion from 24mm until disappearing near 40mm. Pincushion distortion begins at 80mm and becomes mild at 105mm. As usual, this distortion is most noticeable of a full-frame body. Flare? Well, flare is very well controlled with one exception. In very early models of this lens, a very bright point-light source positioned precisely in the corner of a full frame viewfinder with the lens set to 24mm and not stopped down much will result in often beautiful but generally not wanted rays of flare. The rays gets smaller as the lens is stopped down. The rays fade away as the focal length is increased until completely disappearing at 35mm or so. Canon has posted a Service Notice acknowledging the flare problem and will repair any affected lenses (a Canon date code/control number less than UT1000) at no charge (including shipping). Be aware of this issue if buying an old used lens as it may or may not have been repaired. The above picture attempts to show the maximum rays-of-light flare I could produce at the tested focal lengths and apertures. I was shooting into a very bright spot light positioned just into the frame. The rays disappear by 35mm. I eventually sent my 24-105 L to Canon for repair - they promptly replaced the lens with a new one. The new copy does not exhibit the rays-of-light flare issue and works excellently. The 24-105 L's color and contrast are excellent. The rectangular baffle (above) over the rear of the lens is purposed to increase contrast and reduce flare/ghosting. CA (Chromatic Aberration) is overall well controlled, but expect to see some CA in areas of harsh contrast toward full-frame borders at both ends of the focal length range. 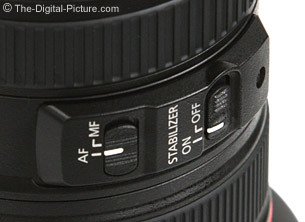 The 24-105 L features a reasonably fast widest aperture setting of f/4 which remains constant throughout the zoom range. This lens rounds out Canon's f/4 zoom lens line - Up to 200mm at least (many of us would like to see a Canon's f/4 zoom lens line extended to include an EF 200-400mm f/4L IS USM Lens). Eight circular aperture blades provide excellent quality defocused image quality (bokeh - foreground/background blur). While f/4 in this focal length range is not the best at creating diffusely blurred backgrounds, close subjects at 105mm can have pleasingly blurred backgrounds. Canon's latest generation Image Stabilizer (IS) provides an additional 3-stops of handholdability in the 24-105 L. This is definitely one of my favorite features of the 24-105 L. The 24-105 L's IS is very quiet and very well behaved (does not jump when starting, ...). IS does not stop subject motion blur, but it is excellent for stopping camera shake. IS allows use of narrower aperture settings to increase DOF (Depth of Field) in handheld shots with non-moving subjects (landscapes, sculptures, art ...). IS allows use of longer shutter speeds to create motion blurs - such as moving water. Or simply shoot handheld in low light levels with the lens wide open using IS to steady the shot. Theoretically, IS enables this lens can be shot handheld at shutter speeds as low as 1/3 second at 24mm on a full frame body. Your results will depend on how steady you are, but I am seeing sharp shots at 1/3 second (and many longer) at 24mm and 1/6 second (and longer) at 105mm. Very nice. A tripod was not used for most of the 24-105mm sample pictures (link below) with shutter speeds below 1 second. I would unscientifically rate this lens as delivering a keeper rate as high or higher than any lens I own or have owned. And most of my throw-aways are the fault the person behind the lens. Also very nice are the recessed switches for IS (on/off) and AF/MF (Autofocus/Manual Focus) as shown above. Canon's previous switches are nice, but raised and susceptible to being accidentally changed to a different setting. I have missed shots on occasion because I inadvertently turned IS off on other lenses. Although still easy to use, the recessed switches should eliminate this problem. The Canon EF 24-105mm f/4L IS USM Lens' short MFD (Minimum Focus Distance) provides for a very reasonable MM (Maximum Magnification). While not close to a 1:1 macro lens, the 24-105 L can take nice flower shots, product pictures ... Although it is not compatible with Canon's extenders, extension tubes will extend the 24-105 L's macro capabilities. Canon makes a 12mm extension tube and a 25mm extension tube. The Canon 500D is a close-up lens that attaches to the filter threads - it also allows closer focusing distances. The 24-105 L ships with a Canon EW-83H lens hood and a Canon Lens Soft Pouch. If you want a more-protective case, the Lowepro Lens Case 4S is a good choice. It will hold the 24-105 L with its hood in place. Prior to the introduction of the 24-105 L, the Canon EF 24-70mm f/2.8L Lens was unquestionably (in my mind at least) the best general purpose Canon zoom lens available. The 24-105 L now shares this designation. Both lenses are excellent - and they complement each other well. Since many people cannot afford both of these great lenses, a decision needs to be made between them. And requests for help with this decision may perhaps be the greatest single reason for email to be sent to me. I've given my request to Canon (not saying I have any leverage) for a 24-70mm f/2.8L IS USM Lens, but until they introduce such a lens, this decision will continue to be made. So, let me see if I can help. The 24-70mm f/2.8L Lens' big advantage is its wider constant aperture. Going from f/4 to f/2.8 makes a big difference. This 1 stop change in aperture is equal to allowing twice as much light through the lens. And this of course yields a shutter speed that is twice as fast at the same ISO setting. When you need to stop action (people are rarely motionless) - especially in low light, the 24-70 L holds a big advantage. The wider aperture also creates a more diffusely blurred background at similar focal lengths due to shallower DOF (Depth of Field). However, the longer focal length on the 24-105 L creates more background blur at 105mm and f/4 (from compression) than at 70mm and f/2.8 - so there is some leveling in this differentiator. Possibly more important is the ability of some camera bodies to focus more accurately with f/2.8 and wider aperture lenses. A somewhat brighter viewfinder accompanies wider aperture lenses. 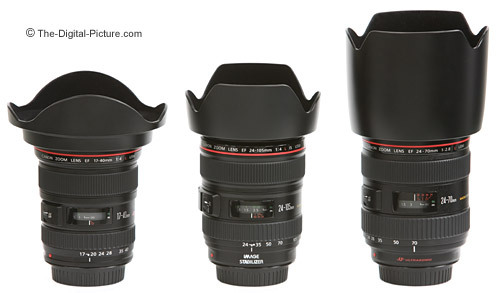 The Canon EF 24-105mm f/4L IS USM Lens' big advantage is the 3-stop IS. IS will dramatically help reduce camera shake-caused blur when shooting handheld at slow shutter speeds. The 24-105 can be handheld in about 1/4 the light levels required for the 24-70 to be handheld in as long as the subject is still. IS cannot stop subject motion. The extra 35mm of focal length on the long end of the range is a nice advantage of the 24-105 L. You can get an idea of what this difference looks like in the focal length comparison above. This additional focal length is especially nice for portraits on a full-frame body. 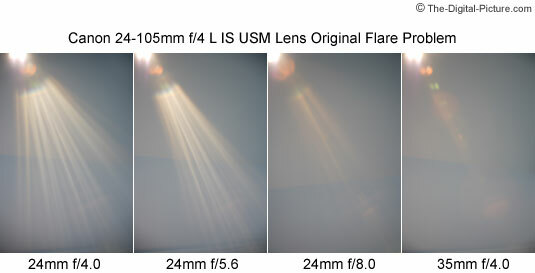 At short distances, the 24-105 L at 24mm is wider than the 24-70 L at 24mm (lenses are rated at infinity but subject framing can vary at close focus distances). The Canon EF 24-105mm f/4L IS USM Lens, as you likely saw earlier in this review, has a nice size and weight advantage over the 24-70 L - .7" (16.5 mm) shorter and .6 lb (280g) lighter. And the 24-105 L lens hood is much smaller as can be seen in the picture below. Pictured above from left to right with their respective lens hoods in place are the Canon EF 17-40mm f/4L USM Lens, Canon EF 24-105mm f/4L IS USM Lens and Canon EF 24-70mm f/2.8L USM Lens. As mentioned before, the 24-105 L's hood extends with the lens (most lenses behave this way) while the much larger 24-70 L hood stays in one place. The 24-70 L extends inside the hood - the overall size of the 24-105 with the hood in place changes while the 24-70 L stays the same length. Because the 24-70 L lens hood is in a fixed position (it does not extend/retract), the objective lens retracts deeper into the hood as the focal length is increased. In other words, the 24-70 L lens hood extends much farther from the objective element of the lens at 70mm than at 24mm. The 24-70 L is using an appropriate-for-the-selected-focal-length lens hood at all focal lengths while the 24-105 is using a made-for-24mm hood at all focal lengths (like most lenses). As you saw in the chart above, the 24-70 L focuses closer (1.25'/0.38 m vs. 1.7'/0.45 m) and yields a higher maximum magnification (.29x vs. .23x). Price, build quality and image quality differences will likely not affect the purchase decision of many. Both lenses are very sharp. Both lenses have good color and contrast. The 24-105 L has less light fall-off wide open than does the 24-70 L wide open, but the 24-70 has a slight advantage at comparable apertures. The 24-105 L has slightly less CA than the 24-70 L. Both are very good in this regard only showing CA in harsh situations at their widest focal lengths. The 24-105 L is shown above mounted on a Canon EOS 5D Mark II. 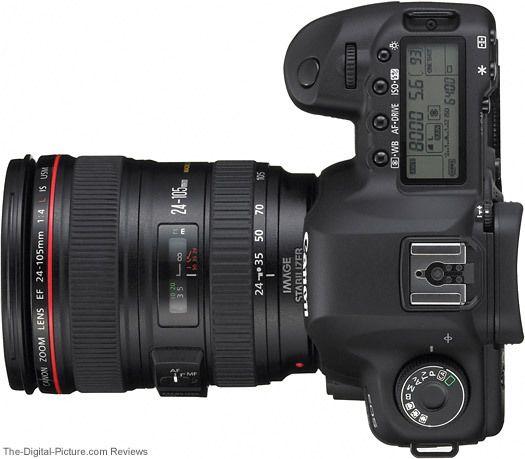 I am sure that many Canon EF 24-70mm f/2.8L Lens owners will also have a 24-105mm L in their kit. Indoor event photographers will *probably* select the 24-70 L while landscape/outdoor, travel and portrait photographers might prefer the 24-105 L.
Since this review was written, Canon has introduced two additional lenses very deserving of your consideration - the Canon EF 24-70mm f/2.8L II USM Lens and the Canon EF 24-70mm f/4L IS USM Lens. Check out those reviews to get the complete picture. For my personal uses in this focal length range, the Canon EF 24-105mm f/4L IS USM Lens is on my camera more than the 24-70 L (now 24-70 L II). If your needs are for wider focal lengths and you are using a 1.6x FOVCF body, you should also consider the Canon EF-S 17-55mm f/2.8 IS USM Lens. It is another excellent choice.